This is a visiting supporters bus in Sheffield for a football match. It’s parked here on Bramhall Lane because the driver was instructed to do so by South Yorkshire Police. Large numbers of buses are parked in this area on match days and the police instruct them to park in areas where parking is not normally allowed. The bus is parked almost exactly where it will cause the most difficulty for cyclists. A little thought and care by the police would have ensured that there was sufficient space for cyclists to use the safe cycling route although it would have been necessary to place warning signs for cyclists and motorists since the parked buses obscure cyclists’ ability to see vehicles on Bramhall Lane which is a busy road with fast traffic at this point. It’s not clear whether the Police in this case are actually instructing this bus driver to break the law as the Police may constitute a “lawful authority” in the terms of the Road Traffic Act 1988. What is clear is that the police are instructing drivers of very large vehicles to park so as to cause danger to cyclists. It’s quite clear that the officers involved neither understood nor cared about the danger they were causing and this indicates that the extraordinary lack of concern for public safety that South Yorkshire Police showed at the Hillsborough Disaster in 1989 is still a problem 25 years later. Police officers are expected to be experts on road safety so there is no excuse for them creating this unnecessary hazard. The 1988 act makes it clear that obstructing a cycleway in this fashion is not allowed. Here is a row of 8 buses parked on the cycleway at Asline Rd, not far from the scene in the first photograph. Again the drivers were instructed to park here by the police, this has been a long standing practice but Sheffield City Council have created a cycleway along this stretch and have made it clear that it is not intended to be used as a bus park. 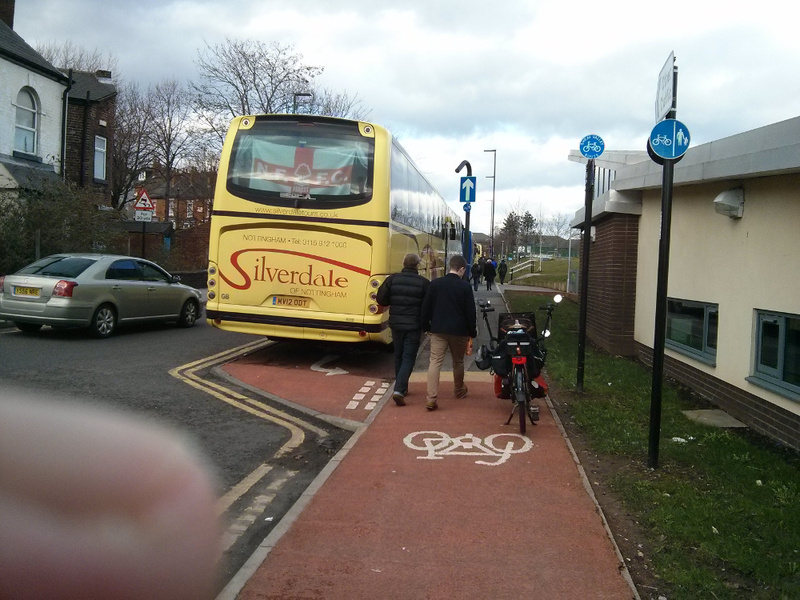 The police continue to ignore this despite complaints from CycleSheffield. You can see from the photograph that the footway alongside the cycleway is narrow and, this being a match day, there is a lot of foot traffic. From this direction cyclists have the option of using Asline Rd, which is one way, if they feel safe doing so, but cyclists coming towards the camera are obliged to use the footway. This puts them in difficulties for two reasons. First they are breaking the law and secondly they are cycling against the flow of pedestrians walking towards the football ground. So South Yorkshire Police are encouraging coach drivers to act in ways that put cyclists in danger, blocking one of Sheffield’s very few through cycle routes in ways that would never be allowed with a main road, and forcing cyclists to break the law by cycling on the footway, putting cyclists into conflict with pedestrians. Why would I, as a cyclist, support or cooperate with the police when clearly they don’t give a damn about me? I discussed this problem with Mick Nott, Chair of the campaign group CycleSheffield. He felt that this incident was very typical of a disregard by South Yorkshire Police towards these issues and his general impression is that the police are more concerned with prioritising crimes involving property than public safety. Recent national surveys indicate that the behaviour of other road users is one of the biggest reasons why people will not cycle and the evidence collected by the current City Council inquiry into cycling confirmed this in Sheffield, despite the clear benefits to health, environment and convenience. All road users want more enforcement of the rules of the road but this is now a low priority with SYP. This entry was posted on 16 February 2014 at 21:57 and is filed under Agitation, Lawbreakers, Urban Cycling. You can follow any responses to this entry through the RSS 2.0 feed. You can skip to the end and leave a response. Pinging is currently not allowed. Good photos. I still can’t quite believe that this actually happens… When I’m back in a couple of weeks I’ll be protesting. A nice big organised bike ride on the path on a match day should do it. just a thought. 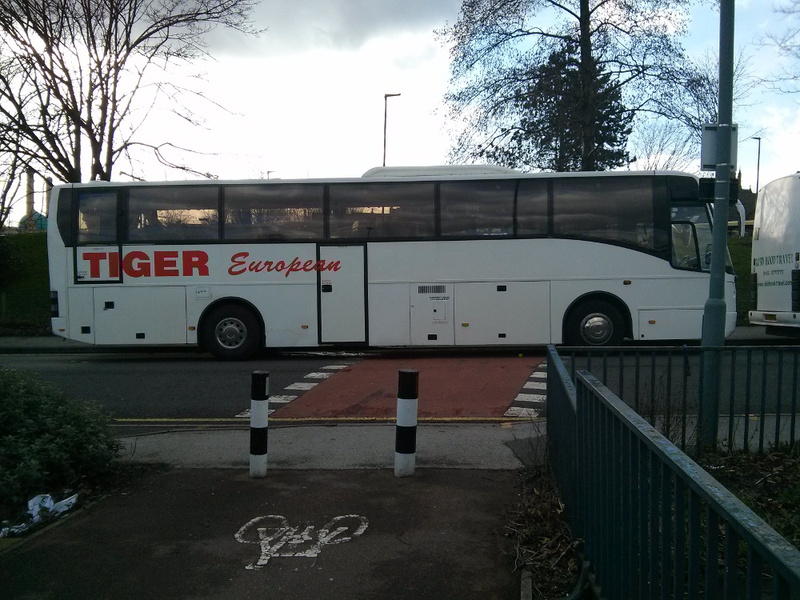 By the way coaches park on the cycle way at other times too – not just match days. Apparently parking in the school car park is too hard ! Don’t worry Simon, I’ve notified the Police Commissioner, Cycle Sheffield are taking it up with the police and Sheffield Council and Matt’s idea is a good one as well as showing some serious commitment since he has posted it while cycling in West Africa.